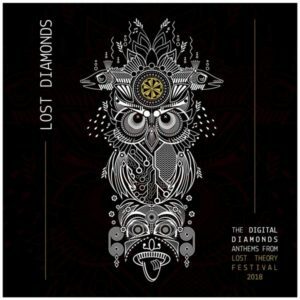 Digital Diamonds presents eleven exclusive anthems from all their artists who performed at Lost Theory Festival 2018 in Spain, carefully selected by label heads Alic. Get ready for thrilling sounds, undiscovered but yet not lost diamonds, shaped by Alic’s progressive taste. This is a feast for all lovers of the pure Digital Diamonds sound! Artwork by Sonic; painting by diz4real. MP3 Download | FLAC Download | WAV Download · Download count: 17,495. Guys, please help. Why cant we no longer listen to music samples first like we use to before choosing to download. Thanx. You can. You have to activate/ install/ make available the Flash Player for your Internet Browser. WOW ! Excellent works here ! Love it ! Hope next year I can be there in Spain again ! I can’t wait to crank this on a big system! I have wanted to go to lost theory for years… never able to. Thank you Digital Diamonds for the tasty treats! Hello guys can you help me identify these two sounds appearing at 2:56 and 2:57 in track number 6? I heard those in another set on a festival I was. But the focus there was more on these two sounds. I really enjoyed it but I sadly don’t know the song name nor the DJ (although I remember that it was a female in her 20s, maybe 26). Any help to find a song with more of this is appreciated. gold.. like always!!! cant wait to hear on a big system! Such a piece of art!! !